With saddened hearts, the family of Frances Innis announces her passing on Friday, October 26, 2018, at the age of 87. Bezanson and Mary Elizabeth (Whalen) Bezanson, Frances was the ninth of fifteen siblings, and part of a very musical family, which relocated to Elderbank, Nova Scotia in 1936. The family’s livelihood consisted of farming and an annual Christmas tree business. It was in Elderbank that Frances received her formal schooling and where she spent the early years of her marriage and motherhood. Frances, who throughout her life has been affectionately called Fran, Francie or Frannie, was predeceased by her loving husband, Chester, who was never far from her thoughts following his death in 1998. Married December 17, 1947, following Chester’s return from active service in WW2 and an ensuing courtship, Fran and her beloved, Ches enjoyed 50 years of marriage and the raising of three daughters, affectionately known as “the girls”. Together, they established their first home in Elderbank until 1963, and then their much loved and visited home in Marion Bridge, Nova Scotia. Fran was also predeceased by 11 of her siblings, William, Ervine, John, Douglas, Lorne, Eileen, Alma, Rosamond, Vera, Shirley and Freda. She was also predeceased by her grandson, Evan Chester Martens. In saying farewell to Frannie, all of us who knew her acknowledge that we are not only saying good-bye to a daughter, sister, wife, mother, grandmother, great-grandmother and friend, but also to a remarkable individual. With her sharp, perceptive mind, singular memory capacity and wise world-view, she leaves a notable weave in life’s fabric. In her life’s work, Frannie specialized in the domain of the intimate. Home and hearth were her curatorships. It would be difficult to find another who put as much thoughtful and compassionate care into the art of creating a home and raising a family. She was an astute observer of human nature, patient and wise in her counsel. Frannie placed great value on the importance of education in children’s lives, and especially as it pertained to her daughters’ futures. She was very forward-thinking: aware of and concerned about the world issues of her time. She believed in justice and doing the right thing. Fran was an avid, appreciative observer of the natural world, especially birds. With her binoculars at hand, she took great pleasure in observing the comings and goings of wildlife on her property and at the beautiful Leonard’s Cove in front of her home. Fran was a formidable scrabble player and a crossword puzzle aficionado. 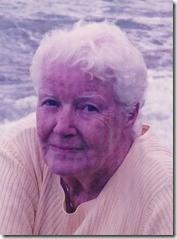 She was an accurate keeper of family history and an often humorous teller of family stories. Her lifelong love of music, dancing and singing was something she really looked forward to and enjoyed. Fran also always enjoyed a cup of tea with neighbors and community friends and relished stimulating conversation. She will be forever missed. Fran is survived by her daughters and their families, Chloe Innis, Calgary, Alberta; Terry (Innis) Martens, husband, Peter Martens, Medstead, Saskatchewan and their adult children, Gabrielle Lizotte, Edmonton, Alberta and Jonathan Martens, Medstead, Saskatchewan; CeLeta (Innis) McDade, partner Daniel R.E. MacMillan, Albert Bridge, Nova Scotia and CeLeta’s son, Mitchell McDade, Hubbards, Nova Scotia. Fran is also survived by three siblings, Harold Bezanson, New Glasgow, Nova Scotia, Joan McNutt, Truro, Nova Scotia and Karen Grace, Tatamagouche, Nova Scotia and nieces and nephews too numerous to mention, but you know who you are. Fran also leaves five great-grandchildren, Blayke and Katelyn Lizotte, Edmonton, Alberta and Gracie, River and Willow Martens, Medstead, Saskatchewan. At Fran’s request, there will be no visitation or funeral services. Her cremated remains will be laid to rest beside her husband, Ches at St. Andrew’s United Church cemetery in her beloved home community of Elderbank, Nova Scotia. The date and time of her interment will follow at a later date, in the Cape Breton Post and Chronicle Herald newspapers. All are welcome who wish to attend the graveside service, followed by a reception at St. Andrew’s. If unable to attend, the family asks that you celebrate Fran in the manner that fits your memories of her life. Memorials in her name can be made to the Canadian Lung Association or a charity of your choosing. Frances’ daughters wish to extend a heartfelt gratitude for all community, medical and palliative support that was provided for their dear mother in the last years of her life. We would like to especially thank Pat Hanson for the tender care she gave to our mother at home before mum joined the wonderfully warm staff at the MacGillivray Guest Home for the final leg of her journey. Say not in grief: “She is no more” but live in thankfulness that she was.